My Snow Peas were a success again this year. 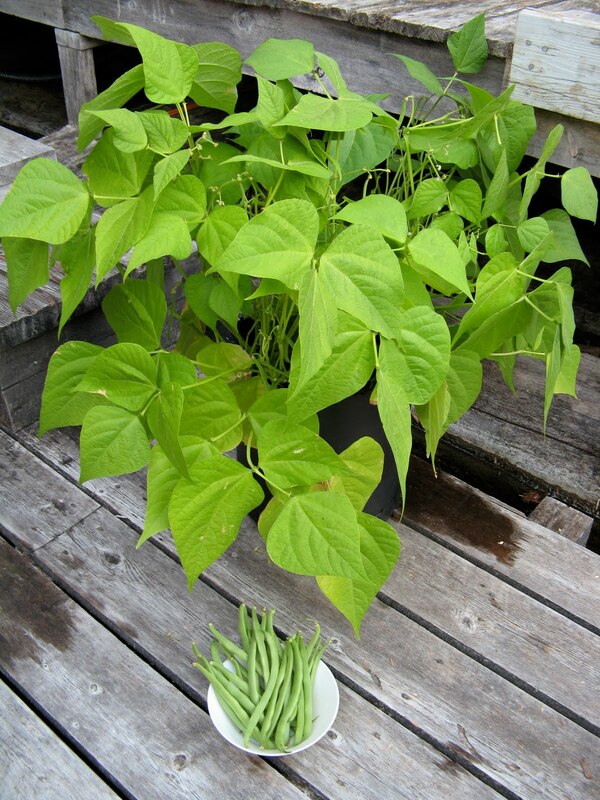 I grow them in half of a 55-gallon blue barrel on the deck. I planted seeds directly in the soil in early April and they started producing by July. I got plenty to eat fresh, but by mid-August I let the last of the crop mature and the plants die back. This is my first year experimenting with seed saving. The International Seed Saving Institute recommends beans, peas, lettuce, peppers and tomatoes for beginners. That's me! It took several weeks for the peas to dry completely. I knew they were ready when the pods were brown and transparent, and the peas rattled inside like little maracas. Then I cut up the stems and leaves for the compost pile. Nothing wasted. I saved more seeds than I will need, but that gives me extras in case there are sprouting problems, and some to share. I shelled the peas, made an envelope, and labeled the contents by seed type and year. Saving my own seeds won't save me a fortune, but it'll be one way to become more self-sufficient. My gardening this year has been filled with lots of highs and lows. My containers have been the most successful, but even with those I've had some problems. 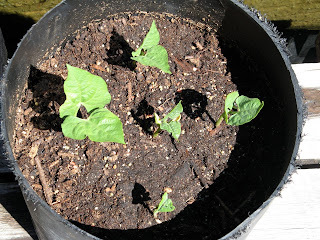 When my eggplant died in June, I decided to try some Bush Beans in the now empty pot. I soaked the seeds and then put them in peat pellets for sprouting. This works successfully for me as long as I transplanted them before the roots became too established. I planted the sprouts in the empty pot. Of the twelve seeds, one was raided by a deck critter. I planted the remaining eleven. Probably too many, but I hated to waste Any. As you can see, five were fast starters. Of the remaining six, three more developed into productive plants. The plants started producing about two weeks ago. On Sunday, I got my largest picking, enough for a nice dinner side dish. And there are lots more still to come. I count my Bush Beans in a pot a gardening success, at least for this year. We travel up and down Powell Lake to our cabin in all kinds of weather, except the extremely windy kind. There are names for places along the way such as The Washout (an earthen dam on nearby Inland Lake burst, washing out a patch to the shore of Powell Lake, Sandy Beach (an easy one to guess), Elvis Point (a life-size statue of the King used to stand here), and the North Sea (John's name for the large, often choppy section below First Narrows). We've also named a few places of our own. Here is Palm Tree Point just south of The Washout. A large fir tree sticks out on an angle with its top branches somewhat lopped off. From a distance, it looks a lot like a palm tree jutting out for more sunlight. It's been a good season for blueberries, so I bought some to can for later use. My two containers had just enough berries for five half pints. Here's how I did it. First, I washed and organized all of my canning equipment. Then I started boiling the water in my canning pot. I use that to sterilize my jars, rings and rims. Then I made a medium syrup using 3 cups of water and a cup and a half of sugar. The syrup will help increase the flavour, colour and shape of the fruit over time. I cooked it slowly, stirring constantly until the sugar dissolved and it almost came to a boil. After removing the syrup from the heat, I added the strained juice of one lemon to help increase the acidity. My recipe called for blanching the berries. I did that by placing a cup of berries in a cheese cloth, immersing them in boiling water for 10 seconds, then plunging them into ice water to stop the cooking process. After a quick drain, I funneled the berries into sterilized jars, making sure to leave enough space at the top for them to be covered by the syrup. The berries will reduce in size during processing, but the juice that extracts makes a wonderful addition to lemonade. I reheated the syrup before ladling it over the blueberries. The recipe called for 1/4" headspace between the top of the berries and syrup, and the rim of the jar. In a few cases, I needed remove a few berries. I left them in a dish to eat later. They were yummy with their lightly sweet coating. I used a stainless steel knife to remove any trapped air bubbles. There were quite a few, so I had to add a bit more syrup to to get the correct headspace back. I wiped the rims to make sure they were clean enough to get a good seal. Once all of the jars were sealed with self-sealing lids and rings, they went into my water bath canner with the lid on to be processed for 15 minutes. Make sure the jars are covered with at least one inch of water. And timing doesn't begin until the water returns and stays at a full, rolling boil. After cooling, test the seals to make sure they are secure. Each jar will be just the right size for a batch of pancakes. I just love blueberries in my pancakes! One of the things that attracted us to Powell River was its friendly people. When we were tourists, everyone we met went out of their way to make us feel welcome. 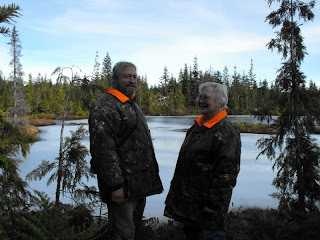 After we purchased our cabin, we wanted to become more involved in our new community. We did that by joining groups with similar interests. 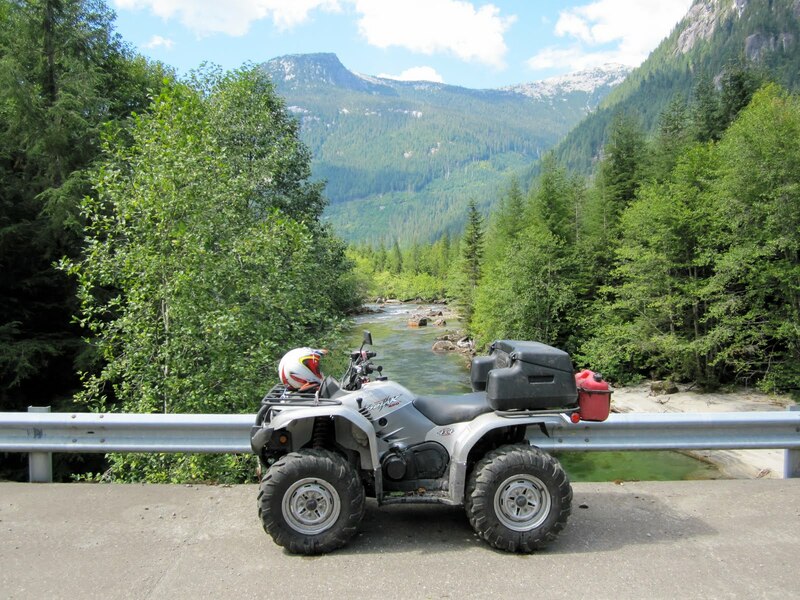 One of those is the Powell River ATV Club. The first time I remember meeting Dave was at a presentation he organized about the Roosevelt Elk relocation program. After another club meeting, Dave and his wife Marg invited us over for a Christmas party. Since then, we've become really good friends. We try to get together when we're both in town for chats, dinners and the occasional Powell River Kings hockey game. 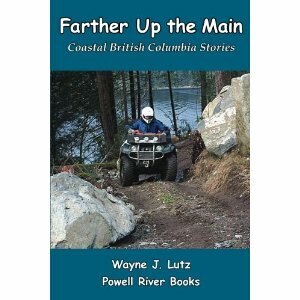 ATV/BC "Powell River ATV Club"
Powell River Peak "ATV Riders on Track for Access"
Dave and Marg are always having us over to their house, even for Christmas dinner. When we have them over, it's at the cabin. 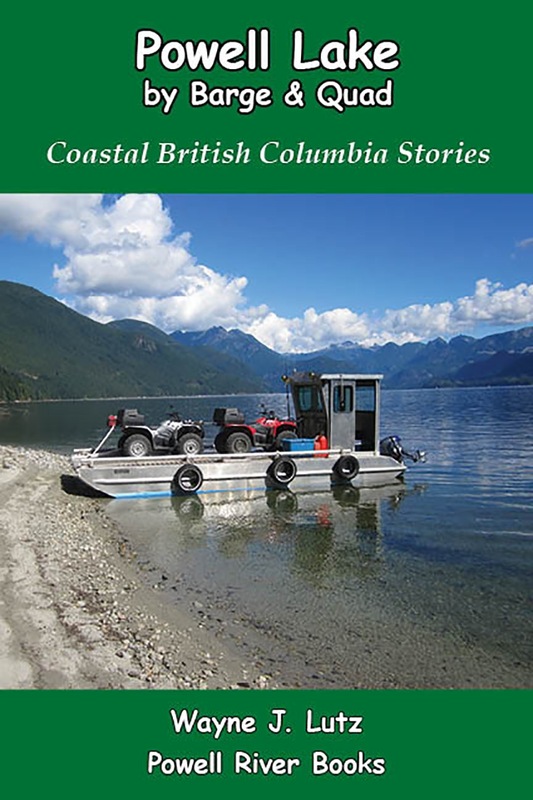 We are usually part of their summer boat shakedown cruise on Powell Lake. Look at the wonderful welcome Wayne gave them this year! And there they were, bearing lots of gifts, including dinner all ready to prepare. They also brought a bird feeder and a squirrel feeder that Dave had made but they no longer needed. He is very talented, especially at wood carving. Dave is one of those "jacks of all trades" that are so prevalent in northern communities. And Marg is right there beside him. They are my idols in many respects. Impossible, you say? Well, not really. But this is one adventure I didn't get to participate in except for launch and recovery. Wayne and John used our cedar log raft to tow their quads up to the head of Powell Lake for three nights of camping and two days of riding. But first, the raft needed a bit of modification to make it go faster. The weather needed to be timed for no rain (makes tent camping easier) and calm water (makes towing easier). To be ready for such a window, Wayne and John decided to tow the quads up and preposition them at our cabin. For the next few days, looky-loos in Hole in the Wall had something new to catch their attention. On Sunday morning, John arrived with his dog Bro ready to go. They weren't sure how long it would take, but estimated five hours. But first, John set up our Campion to push the raft. He thought it would be easier to handle and faster that way. So with lots of extra gas (for the quads and boat), tents, sleeping bags, tons of food, our trusty BBQ, and our tin boat, off they went. 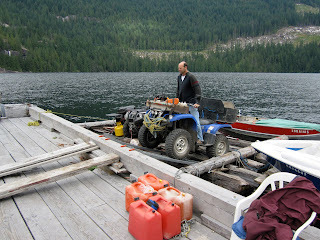 At the head, they were able to tie up to the old logging dock and offload the bikes right there. Pretty slick. Just tie up once and you're done. Otherwise, they could have used the barge ramp. They set up camp right there since they wouldn't be in anyone's way. All logging has shut down for now and Plutonic Power has completed their transmission line installation. 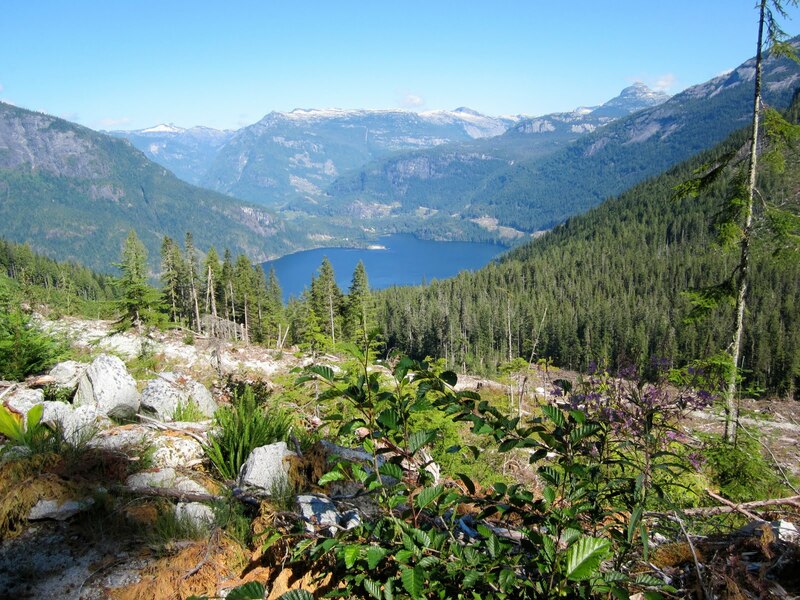 There are extensive logging roads that start at the head of Powell Lake, but they can't be reached from anywhere else. John and Wayne rode for hours each day to dynamic viewpoints, the mill's old snow survey cabin, and cool mountain streams perfect for a cooling swim. Wednesday was return trip time. This would be a longer trip, all the way back to the Shinglemill Marina in one day. The first leg down to our cabin took about five and a half hours. From the cabin, John, Mom and I went down the lake in his boat while Wayne slowly plugged along. John and I hurried down so we could serve as Wayne's landing crew. We met up at Kinsman Beach (right where the adventure began) and John used his ramps to offload the bikes from the raft to the shore. Pretty slick! Swimmers out on a warm summer day thought so too. 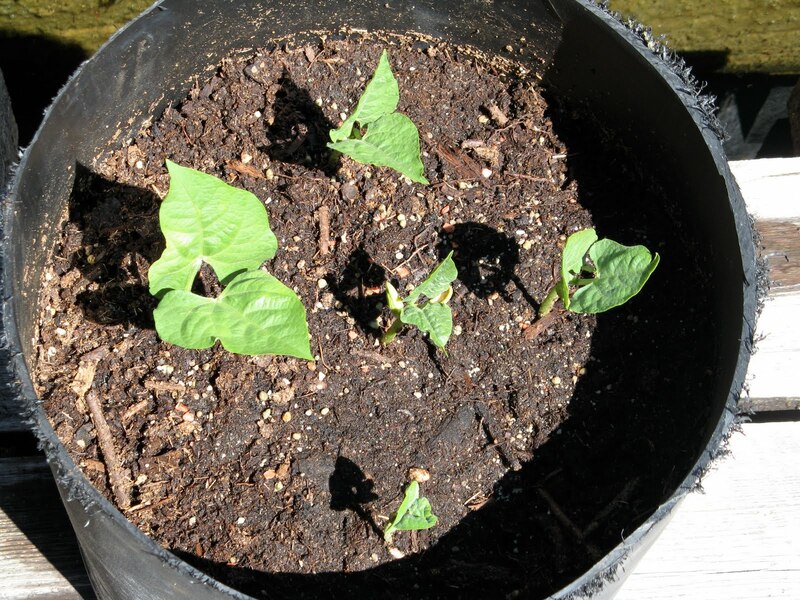 My scarlet runner beans and banana peppers grown in pots were very successful. I love pickled banana peppers on sandwiches, but an open half pint would last quite a while. So I decided to do a mix of half green beans (nice for nibbling) and half banana peppers. I modified a recipe I used last year from my Farm Journal's Freezing and Canning Cookbook. This recipe makes four pints. I only had enough beans and peppers for three half pints, so I cut the liquid ingredients and salt in half. Wash and stem the green beans and raw pack them blossom end down in hot, sterilized canning jars. I used shorter half pint (250 ml) jars, so I had to cut my beans to fit. Seed the peppers and cut them into rings. Put half beans and half peppers in each jar. Add 1/4 teaspoon red pepper flakes per jar (reduce or increase to taste). Add a clove of garlic and a fresh dill head per jar. My dill didn't grow this year, so I used some heads I dried last year. Combine water, salt, and vinegar, and bring to a rolling boil in a non-reactive pan. Pour over the beans and peppers raw packed in the jars, leaving 1/4" space from the top. Use a stainless steel or plastic knife to remove any trapped air bubbles, wipe the jar rim, cover and seal with self-sealing lids and rings. Be sure to follow safe water bath canning procedures. My directions called for 10 minutes in a boiling water bath. The snap of the lids during cooling helped reassure me the seals were good. After cooling and checking the seals, I put the jars in the downstairs bedroom (my coolest room) away from the light. Now they have to rest for several weeks for the flavours to marry. Hundreds of planes arrive from across Canada (including our friend Bob from Powell River) and the US arrive for a week of airplane camping, exhibits and flight demonstrations. If you've never been, put it on your calendar for July 6-10, 2011. If you don't have a plane, drive in for an experience you'll never forget. When we flew to Arlington this week, it was much quieter. With a slight north wind, we landed on Runway 34. It's 5332' long and 100' wide with a good asphalt surface. Runway 11/29 is shorter and narrower, but also in good condition. 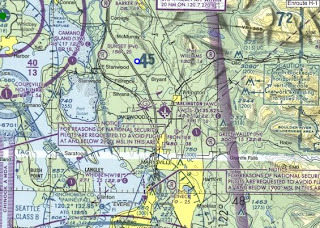 Be sure to keep your eyes open for gliders, ultralights and experimental aircraft that may not have radio communication. After landing, we taxied down to the self-serve fuel pumps. Our destination was the pilot shop next door, but unfortunately it was closed. Another sign of difficult economic times in private aviation. But we did see that the restaurant mid-field was open again, so we hiked down. The NASA Restaurant is open Tuesday through Sunday from 7:30 to 2:30. Darn, we just missed it. We saw a sign for another place to eat near the pumps, so we backtracked and found the Flying J Cafe. You can't miss it at the end of the hanger with a large banner and American flags flying. You can arrive by car or airplane. They are open Monday through Friday from 8:00 to 4:oo and serve breakfasts, burgers, sandwiches, soups, salads, and seafood baskets. The grill was already off, so we had sandwiches and some really tasty clam chowder. 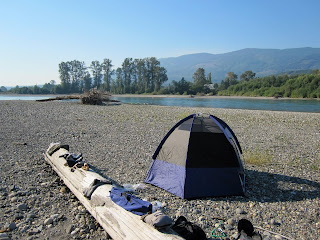 For the last three days I've posted about our sea kayak adventure down the Skagit River in Washington State. Now I've condensed that three day trip into a three minute iMovie. Hopefully, it will help others interested in paddling this same route. I would have loved to see some footage of what it would be like before our departure. What would a movie be without out takes? You just never know what that Crazy Canadian will say! Hope you enjoyed the trip. Thanks for coming along. 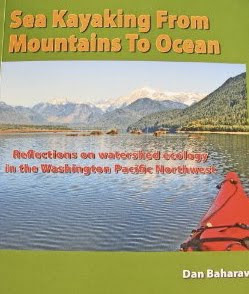 The last book we purchased while planning our kayak trip on the Skagit was Sea Kayaking from Mountains to Ocean by Dan Baharav. 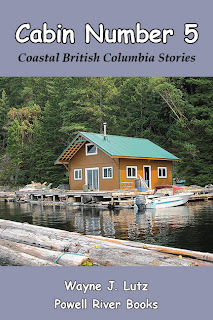 Dan is from Bellingham and has written about local rivers he has paddled in his single sea kayak. 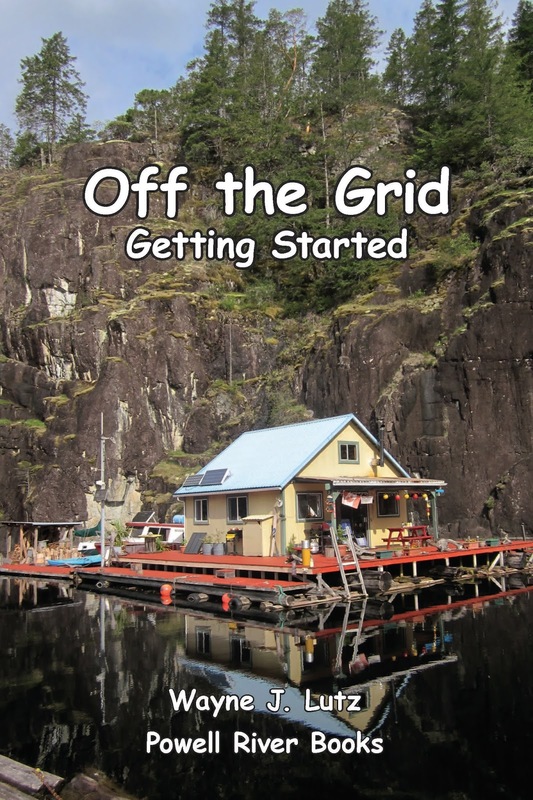 He has a nature and environmental focus to his writing in addition to paddling information. 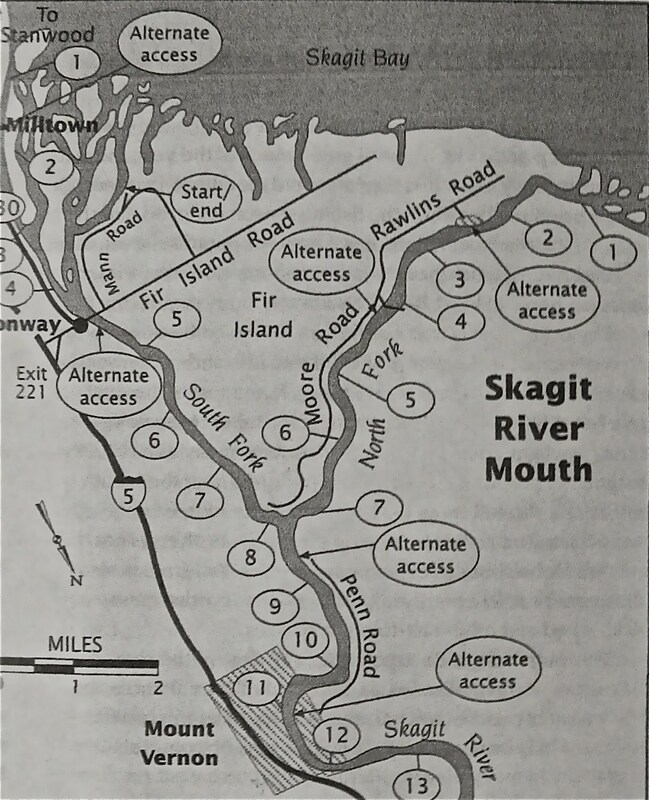 His book included the northern section of the river down to Rasar State Park, but didn't pick up again until Sedro-Woolley. But that was perfect for our third and final day. We rose early with the sun coming over the trees. Wayne chilled our fruit cups in the river before serving breakfast on our log. We discovered how important a big log is to the camp environment. It was our bench, backrest for improvised chaises using our Therm-a-Rest pads, line for drying wet clothes, and all around storage area. We wanted to start early because this would be our longest day of paddling. From Ross Island we would continue down river past Sedro-Woolley, under I-5, into Mt. Vernon, and finally the tidally zone of the river delta. During the night we heard lowing cattle and barking dogs from the farm across the water. Then coyotes began to sing to the setting moon. The lapping water lulled us to sleep under a star-filled sky. While we had a quick "breakfast" on our log, we watched three herons fishing in the shallows. Then it was into the kayak and on our way. On this leg there were many more log jams and snags to avoid. They were the heaviest between our campsite and just below I-5. In two places, the water got shallow and we had to pull up our rudder, but we never went aground. In one place we took the wrong channel, but there was just enough water for us to skim over the rocks on fast running ripples. Don't tell Wayne, but I thought it was kind of fun by then. We saw only one boat of fishermen on the upper river. Nearing Sedro-Woolley, we saw them again. As we floated by, they serenaded us with a rousing chorus of "O Canada." Our flag got us again. The area became more populated with cabins, homes and resorts along the high river bank. By this time we had been paddling for about two hours, so we decided to take a short stretch on one of the many gravel bars. 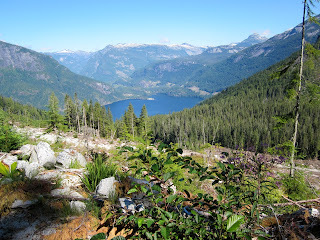 While we were there, we saw two fishermen trying for Dolly Varden (large trout-like fish). The river also has steelhead and salmon in season. Going under a roadway bridge was noisy enough, but when we got to the I-5 freeway with its four lanes of fast traffic, it was a cacophony of sound. We couldn't paddle out from underneath fast enough. Here the banks were topped with high earthen dikes to protect the farmlands beyond. The elevation is at or near sea level, so flooding is a common occurrence. Only rooftops and upper windows of the houses beyond were visible. But on a few banks there were little shacks above tiny floating docks. We weren't sure what they were, maybe fish shacks used when the salmon and steelhead are running. We stopped in downtown Mt. Vernon for a late lunch. The best choice was Edgewater Park with its flat beach. We tied Mr. Kayak to a snag, asked a couple if they would keep an eye on it (small world, they were from Concrete) and climbed the trail to some much needed sustenance. Across the street from the park entrance, Las Coronas was perfect. We stuffed ourselves with chips, salsa, tacos, enchiladas, and a tostada. You'd think we hadn't eaten for days. We barely squeezed back in our cockpits. Now the real work of our trip began. Wayne checked the tides, but it takes quite a while for the ebb tide to have an effect this far upstream. The river current was down to 1 mph and we picked up a headwind shortly thereafter. In the tall trees we finally saw and heard some Bald Eagles. These must be resident birds. When the salmon arrive in winter, this whole river system becomes a haven for them. 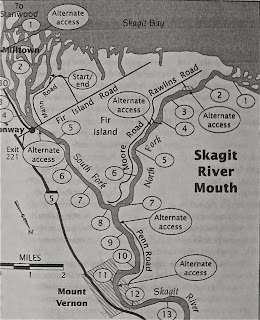 At Fir Island, we went to the left down the South Fork. The river was still wide and deep, no sign of the delta mudflats yet. At 4:30 we decided to call it a day and headed for the Conway boat ramp. We gave Jeanne a call and she came to our rescue in the Ford Tempo. What a great trip, and we still have the delta to explore on another day. Find a campsite with a big log. Even populated areas can be exciting to explore. A GPS is helpful to find places to eat. People are friendly and willing to help.